“During Derby Week, Louisville is the capital of the world,” John Steinbeck described the Derby in 1956. “The Kentucky Derby, whatever it is—a race, an emotion, a turbulence, an explosion—is one of the most beautiful and violent and satisfying things I have ever experienced.” A lot of writers use this quote when discussing the Derby, but we also like Hunter S. Thompson’s take on the event. If you’ve never had the opportunity to attend the Derby, it’s arguably one of the most exciting sporting events in America. In two breathless minutes, fortunes can change hands, but in the two weeks leading up to Derby, Louisville makes its own fortune. When the first Derby was run in 1875, 10,000 spectators were in attendance. Last year, 164,906 people crowded into Churchill Downs to cheer on their horses. That’s not to say that the Derby was always the success that it is today. The track was created by Col. Meriwether Lewis Clark, (grandson of the explorer William Clark), but sadly, his enthusiasm for the sport was not matched by his business acumen. After a rocky first three decades, Churchill Downs was in serious financial trouble by the late 19th century. One memorable year, there were only three horses in the race. 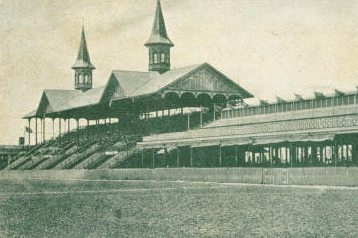 In 1902, a Louisville businessman named Matt Winn, along with a group of investors, took over management of the flagging track. Following a series of renovations and an expanded betting program, Churchill Downs began to draw wider attention and appeal under the new leadership. In 1925, the race was first broadcast over the radio, and in 1952, it was televised nationally. While Churchill Downs doesn’t release their profits, their average for the second quarter (which coincides with the Derby) between 2013 through 2015 was estimated to be $268.1 million. But what does this mean for Louisville? Typically, one in ten people attending the race is visiting from out of town. They’re going to events, staying at hotels and enjoying Louisville’s wonderful restaurants. It’s a massive boon for the local economy, and a great excuse to throw one of the best parties in the world. It’s a tradition that we’re proud to be a part of, and we hope you all get the chance to come to Louisville and catch the race at Churchill Downs.